Even though you have created and set up more than one Thank You page on your shop, just one of them will be shown to the user. You can set priority for Thank You pages in the “Settings” tab of the plugin preferences panel. General: if selected, the General Thank You page will be shown after every completed checkout, no matter what users have bought. In case there is no General Thank You page, the plugin will check whether a Thank You page has been associated with a category or a product. Product Category: priority is given to the Thank You page associated with the product category to which the product belongs. In case there is no Category Thank You page, the system will first check whether a General Thank You page (first) or a Product Thank You page (later) exists. Product: the Thank You page associated with the purchased product is displayed. In case there is no page associated with the product, the Category Thank You page will be shown or, alternatively, the General one. 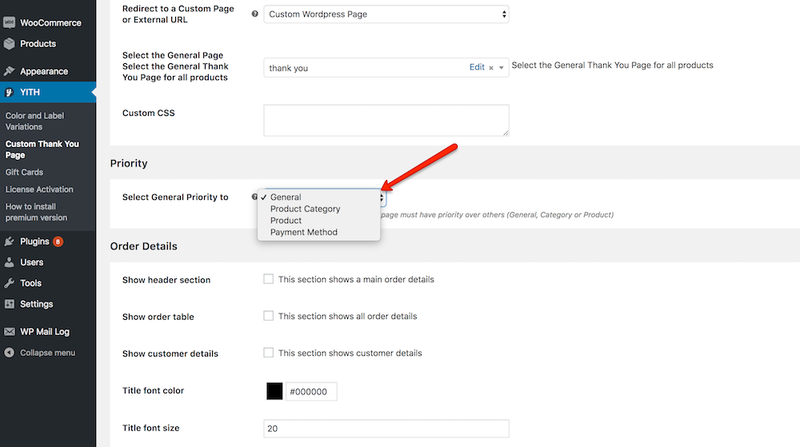 Payment Method priority is given to the Thank You page associated with the the payment method the customer chooses. If there is no Payment Method Thank You page, the system will first check to see if there is a General Thank You page, a Product Category Thank You page (later) or a Product Thank You page (last). In the cart, there are products belonging to different categories and I have set up different Thank You pages for each category and for some products. Which page is displayed, then? If you have given priority to the General Thank You page (and it has been set up) this is the page that will be shown. In the opposite case, the system will display the Thank You page associated with the first product in the list. If there is none, it will check the second, then the third and so on.